Car parks are a byword for an especially grim kind of lighting, its function generally not so much to illuminate as to contribute to the whole malodorous, soul–sapping business of urban parking. 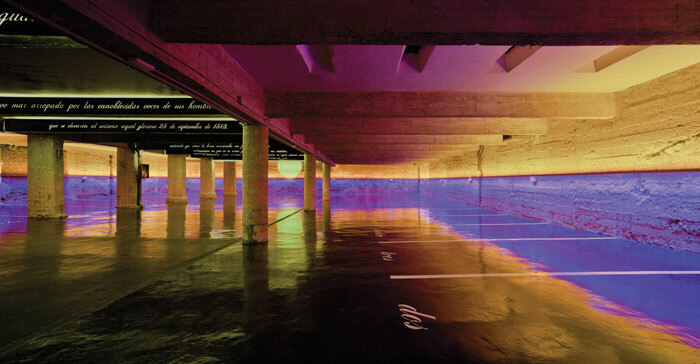 Which is why this art project for a Madrid car park is a particular joy. 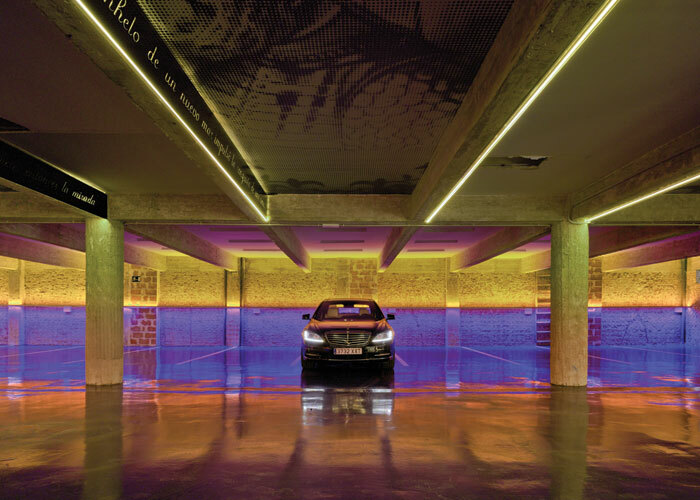 The project involved the renovation of an obsolete two–storey car park in an affluent neighbourhood of the city centre. 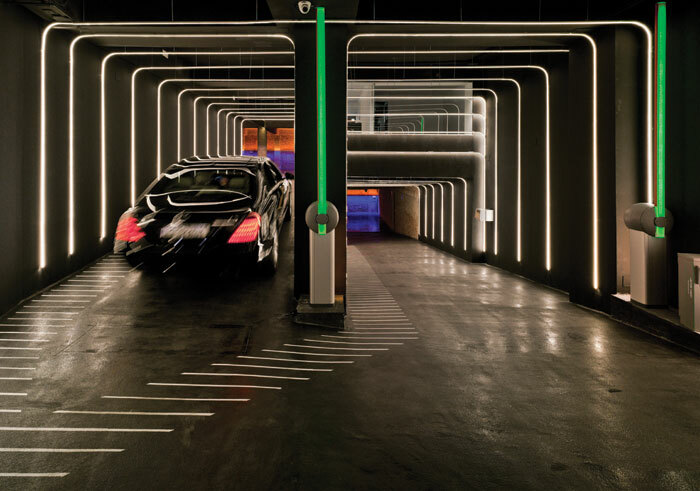 There were three fundamental aims: making the parking more attractive to potential clients, reducing maintenance costs, and minimising impact on the car– park operation. Light was key to achieving those goals. As well as being a cost–effective concept – the lighting system is used as a decorative element – it also reduces maintenance costs, as finishes don’t need to be renewed over time, he adds. The design centres on the 16th– century Spanish explorer Vasco Núñez de Balboa, the first European to reach the Pacific Ocean, and after whom the street where the car park is located is named. The entry comprises a tunnel of repetitive white light arches over a neutral black wall, immediately making the interior more welcome. Inside, the tunnel expands and divides, providing access to a total of 37 places on two levels. The walls of the parking floor were stripped of their old tile cladding and the original brick exposed. The top half is lit in orange and the bottom half in blue, drawing a clear horizon line. The blue lighting, combined with the use of a same–colour epoxy coating, floods both of the highly reflective floors with the intense colour of the Pacific Ocean. When turning the car, drivers are greeted by a huge ‘sunset’, reflecting itself in the sea. A mirrored stretch ceiling covers the last section of the central corridor, generating an optical effect that simulates a complete sun with a simple semicircular lamp. The powerful downstand beams on thick columns have integrated linear LED strips that reinforce the geometry, provide ambient lighting and delineate backlit panels featuring narrative graphics. The backlit panels also provide spill light on to the ceiling planes, which feature portraits of Núñez de Balboa. ‘Unnoticed and blurred from the central corridor, these images become clear from the point of view of drivers when they park, giving them the chance to make their own discovery,’ says Clavel–Rojo. While it’s perhaps easier to identify the transformative effect of light on a renovation project – there is a ‘before’ with which to compare it – it is also clear when a new build has been enhanced by good lighting rather than trashed by ill–considered illumination. Lighting in either case can make or break an overall design. The lighting scheme for the Five Palm Jumeirah is as multifacteted as the beachfront resort complex itself. 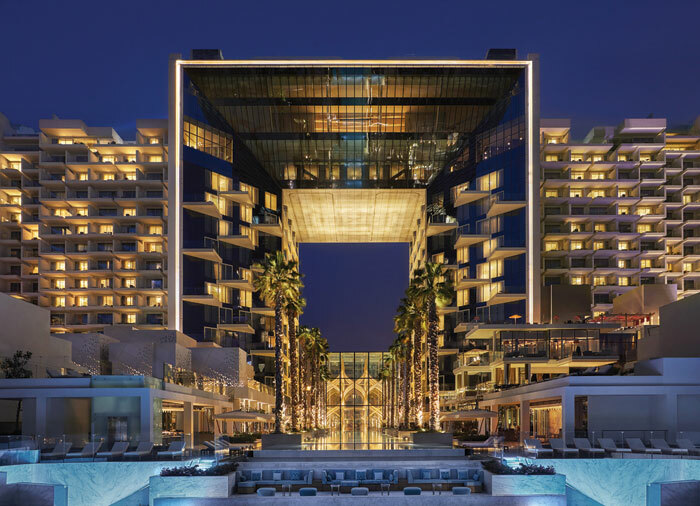 Configured in a striking amphitheatre design with signature central glass cube and 60m vanishing pool, the hotel has 477 rooms and suites across 16 floors, 10 restaurants and nightlife settings, spa, beach pool, kids club, and health and wellness areas. It is the first urban resort of its kind in the region. Where the lighting first undoubtedly comes into its own is the dramatic entrance, where the sight line inside leads to the glass cube housing an imposing illuminated artwork. The intricate wooden creation was inspired by an extraordinary conceptual juxtaposition: the Islamic pointed arch and the structure of DNA. Its construction makes it a challenging proposition to light precisely while avoiding spill and glare. Inverse carried out several mock–ups and trials before deciding to illuminate the sculpture using light sources below the floor. ‘This gives an effective three–dimensional view of the stunning structure,’ says Inverse’s Nicola Agresta. Lighting to the exterior is designed to be subtle, complementing the architecture and landscape without compromising the requisite brightness levels on the ground. Linear sources are concealed in the perimeter of the arch, framing the building with a glow. The palm trees alongside the pool are uplit to create a rhythm, while the pool is delineated with concealed linear LED light sources around the edge, plus a minimal number of pool lights. The low level skirting lighting was designed to frame the planters. The sources selected for the interior are also mainly LED, also to meet LEED requirements. Where appropriate, there is again a high level of integration so that lighting becomes part of the fabric. 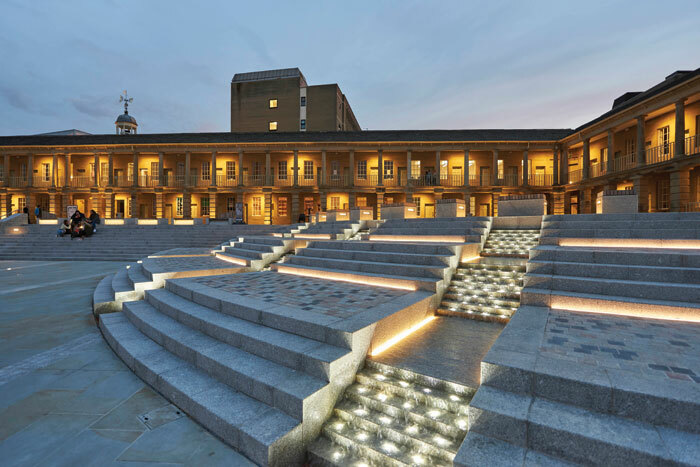 The only remaining 18th–century northern hall built to support the trading of ‘pieces’ of woollen cloth, the Grade I–listed Piece Hall has been transformed into a contemporary public space for the city of Halifax. 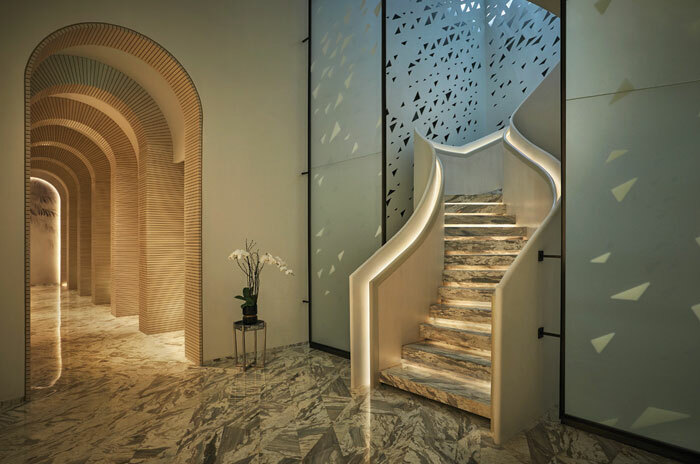 The layered lighting scheme for both the buildings and courtyard reveals and sculpts both the space and the architectural elements. 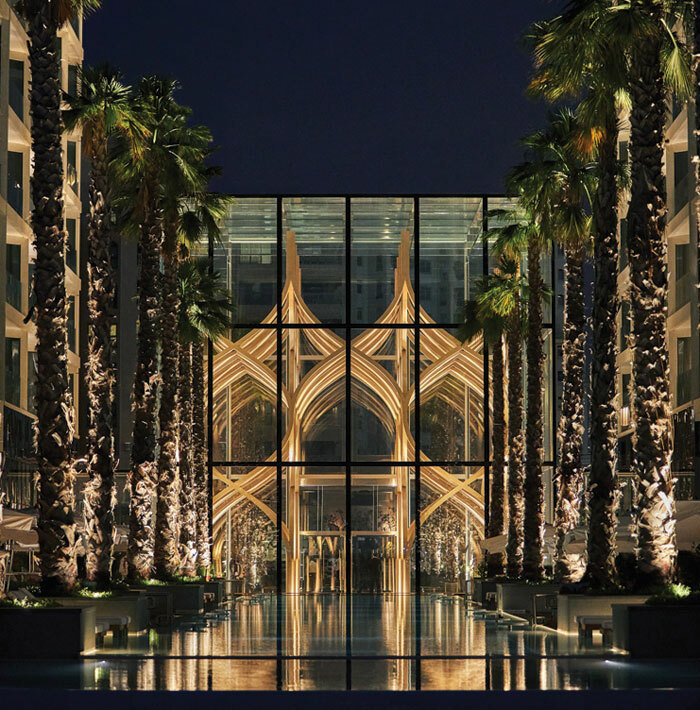 The series of striking colonnades are uplit to reveal form and rhythm, while components such as the steps, water features and bespoke furniture are judiciously picked out with integrated lighting to produce a well– balanced composition. What is effective about the design is that history is respected but doesn’t dominate the agenda – the space is welcoming not intimidating. 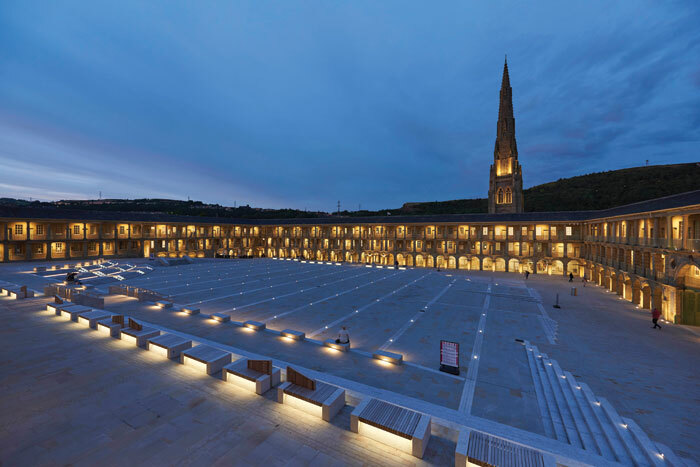 Using cool white light within the plaza and warm for the buildings helps to reduce the scale of the plaza, making it more inviting; it also helps create a strong visual identity. While safety and comfort were obviously important – illumination is provided where there are any changes in level – parts of the space in the centre were left intentionally dark, with only marker lights guiding a path across the flat area of the square. The fitting was purposely chosen with an optic that, although the luminaire is flush mounted, pushes light sideways to create a glow. Using the facade as a reflector to give edges to the square and bounce light back into the walkways, also showed that the centre of the space did not need to be illuminated during normal use. The scheme also shows understanding of scale – lighting only half of the columns provides sufficient light. ‘To light all of them would have been too costly and too energy heavy,’ says Phillips. There were inevitable challenges to lighting such historically sensitive buildings. Fittings could not be attached to the historic facade unless there was already a cabling route, so fixing to the original building was very minimal and had to be agreed with a number of consultants. It was agreed early on that the space was to have no columns. As well as cluttering the space, they would not have been historically appropriate for the age of the buildings, and therefore the majority of light is provided from the hard landscaping. This meant paying a lot of attention to balancing levels and contrast, and avoiding glare. A control system allows lighting to dim, offering various scenes for temporary events, and reduces the overall energy consumption by offering a timeclock– controlled programme suitable for dusk, dawn and security.